These changes to the language and the web as a whole, makes the ecosystem better. The frameworks built on this new ecosystem will be able to provide better ways of solving problems that the developers are actually facing. This is one of the reasons why the Angular team has decided to write the next version, Angular 2 from scratch leveraging the latest enhancements of the web. In case you haven't heard of it earlier, Microsoft and Google are working together to help make Angular 2 better. Angular has been using AtScript, a superset of Microsoft’s TypeScript and both these languages have been merged now into TypeScript. Going forward, you will be writing Angular 2 applications using TypeScript. In this article, we will take a look at the core concepts and the basic features of Angular 2. Disclaimer: Angular 2 is still in alpha. The code snippets shown in this article and in the supporting sample code may not work in the future releases. Like Angular 1, Angular 2 (currently in alpha) is built on a set of concepts that are used throughout the framework and they would be used directly or, indirectly while writing applications. Let’s take a look at them. At the heart of any front-end web framewor is the technique used for change detection. Angular 2 adds a powerful and much flexible technique to detect changes on the objects used in the application. In Angular 1, the only way the framework detects changes, is through dirty checking. Whenever digest cycle runs in Angular 1, the framework checks for changes on all objects bound to the view and it applies the changes wherever they are needed. The same technique is used for any kind of objects. So here we don’t have a chance to leverage the powers available in objects - like observables and immutables. Angular 2 opens this channel by providing a change detection system that understands the type of object being used. In addition, the change detectors in Angular 2 follow a tree structure to detect changes. This makes the system predictable and it reduces the time taken to detect changes. · Immutable Objects: As the name itself says, an immutable object cannot be modified as it is created. A change made in the object re-creates the object itself. The re-creation kicks in an event to notify user about the change. So the bindings under the subtree using immutable objects, are not parsed until such an event occurs. When the event is raised, the subtree is checked and the changes are applied on it. The checks will not happen on browser events following this check, unless the event is raised again. · Observable Objects: The observable objects implement a reactive mechanism of notifying the changes. They emit events when the object changes. Subscribers to these events get notified whenever the object changes and they can use the new value to update UI or, perform the next action upon receiving the notification. Angular 2 understands observable objects. 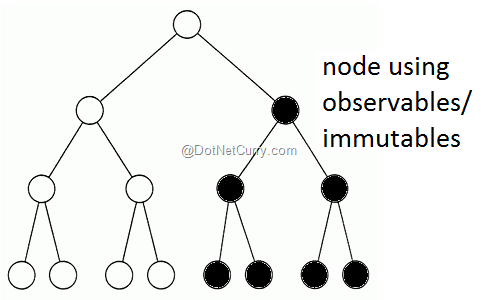 When an object sends a change notification, the framework checks for changes in the subtree under the node containing the component depending on the changed object. This subtree won’t be checked for any changes until another change event on the same object is raised. Both immutable objects and observable objects reduce the number of comparisons to be made while detecting changes. This improves the performance of the application. There is no restriction on usage of libraries for the two types of objects discussed above. We can use any library according to our convenience. It is also possible to use both immutable objects and observable objects together in the same application. We need to tell the framework that the component uses one of these objects. It can be done using a property in the component annotation. Angular 2 continues to use this pattern. It now provides us with a simple and yet powerful DI container. The DI container in Angular 2 has a single API for injecting dependencies and it also provides ways to control lifecycle of dependencies and specify the type of dependency to be injected when a type is requested. The DI works in the same hierarchy in which the components are built. Dependencies have to be declared along with annotations of the components. A dependency declared on a component can be used either by the same component or by any of the children of the component. Children components can override the way a dependency is declared in the parent as well. After the application starts, we need a process to keep running behind the scenes that kicks in the process of change detection so that the model and the UI are always in sync. Angular 2 includes a library called Zone.js, which helps us in keeping things always in sync. A zone is an execution context that persists across async tasks. All operations performed in Angular 2 are carried under this context. We don’t need to invoke them or attach operations to them. Zones know what kind of operations to be handled in the context. Because of zones, we don’t have to take any pain while including non-angular UI components in Angular 2. Like in Angular 1.x, directives in Angular 2 are used to extend HTML. The directives in Angular 2 are more similar to the way DOM appears and they provide ways to get into life cycle events to take better control over the way a directive works. Architecture of the directives in Angular 2 embraces bindings a lot and hence reduces the need of direct DOM manipulation. Also, we don’t need to deal with different restrict types as well as with the camel case notation while naming directives; both of these properties are handled by a single selector property. · Component Directives: Everything in an Angular 2 application is a component. The application starts by bootstrapping a component and other components are rendered as children of this component. So hypothetically if we take an aerial view, an Angular 2 application looks like a tree of components. The components are used to define a new HTML element. This feature is built using the techniques introduced in HTML5 web components. If the browser doesn’t support any of the features, the framework emulates them. As we can see, the component is a class decorated with the annotations Component and View. An object of this class is the view model for the component. Any public property defined in this class can be used to bind data in the component’s template. If you observe this snippet, the directive interacts with the host element through configuration. And if we use this feature effectively, we can avoid performing direct DOM manipulations in the component. Such behavior makes the code easy to port to non-browser based applications. · Directives with ViewContainer: The directives that use a ViewContainerRef object can take control over the content of the element on which they are applied. These directives can be used when template of the view has to be shown/hidden based on a condition, to iterate over or, to tweak the content based on a scenario. The directives like ng-for and ng-if fall into this category. Like every front-end framework, Angular 2 has a very good support for binding. As already mentioned, view-model for any component is an object of its class. Public properties and methods of the classes can be used to show data, handle events and handle properties of the HTML elements. The framework introduces a different syntax for data binding. The bind-title attribute in the above snippet is not a decorator directive, the prefix bind is a convention and it is an alternative syntax to the square bracket [attribname] syntax used earlier. The bind- prefix can be used with any valid HTML attribute to bind the property with a value on the view model. Similarly, public methods defined in the component class can be used to handle events. Now that we had a tour around some new features of Angular 2, let’s build a simple component. An Angular 2 application can be written using ECMAScript 5, ECMAScript 6 (ECMAScript 2015) or, TypeScript. The code written in ES6 and TypeScript is almost similar except that TypeScript would have support for types. We will build a simple music player component using ES5 and then using TypeScript. Note: Instead of writing the component in both TypeScript and ES5, I could have used a TypeScript compiler to generate ES5 code. However my intention in this article is to show how Angular 2 code can be written using both TypeScript and ES5. As the Angular 2 application has to start with a component, let’s bootstrap the application using the MusicPlayerHost component. The bootstrap process has to begin after the DOM content is loaded, so we need to add a listener to the DOMContentLoaded event to bootstrap the application. This task copies all of the transpiled files into the js folder. The HTML file rendering the application loads the helper libraries and then loads the main module of the application using SystemJS, which in turn loads all other modules. Notice the constructor in the above class. It accepts a parameter of type MusicPlayerInfo and we don’t need to add anything in addition for dependency injection, as the type specification in the constructor itself is used for injecting the dependency. Similarly, the MusicPlayer component needs the annotations Component and View from Angular’s core modules and MusicPlayerInfo from the current folder. The annotations Component and View have the same responsibilities as they had in previous section; they just appear a bit different. To bootstrap the application, the above component can be passed to the bootstrap function. This article was reviewed by Gil Fink.